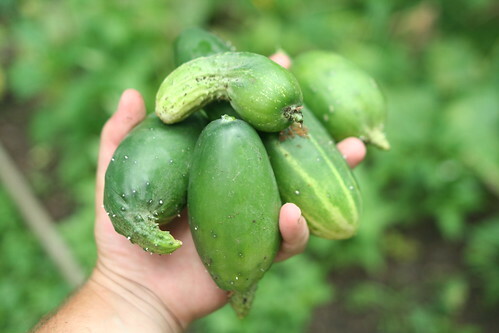 This past weekend my brother and I did a little pickling with the bumper crop of cucumbers we have grown in our garden this year. 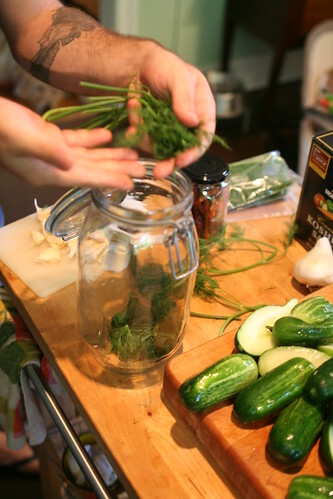 We like to keep our pickles pretty simple both in the ingredients and in the process. We skip the whole canning thing and instead opt for refrigerator pickles since we would prefer to eat them in a weeks time not sometime next year. 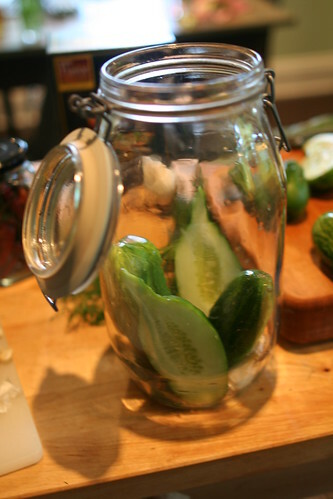 The end result is a crisp half-sour style pickle. The recipe is pretty simple. 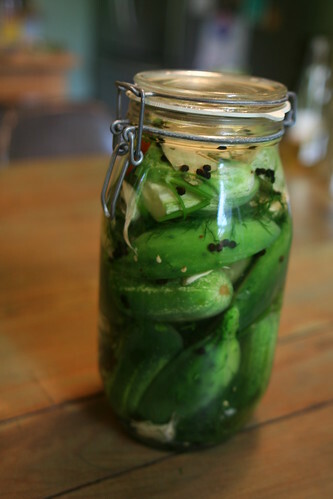 Layer in dill and crushed garlic cloves followed by several cucumbers. Build up several layers of the ingredients until you get to the top of the jar and then add a bunch of whole pepper corns, a few table spoons of salt, and then fill the jar up with boiling water. Of course you can also add other spices, with this batch I threw in a few dried cayenne peppers we grew in last summer’s garden for some extra spice. Close the top of the jar and give it a good couple shakes and turns to make sure the salt dissolves well. Then the tough part comes, stick them in the fridge and wait a few days. Start tasting them over the next few days until the reach the desired flavor. You’ll find the longer they sit in the brine the stronger the flavor gets…however chances are they wont be sitting in the brine for that long.